Saturday November 17th 1883 A real pleasant day. I was busy about the house in the forenoon and after dinner went over to order groceries. Hatt was over with the children all day. I knit all the evening. 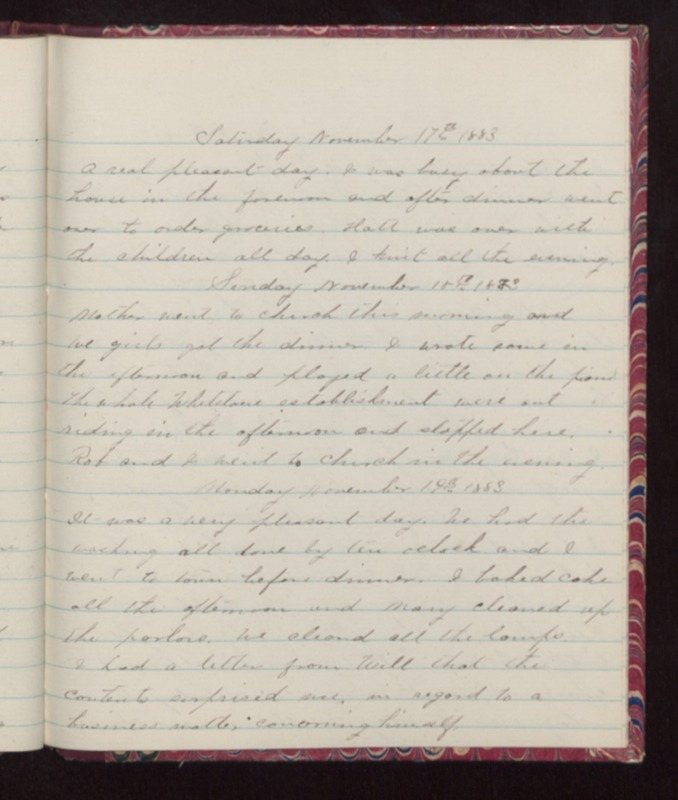 Sunday November 18th 1883 Mother went to church this morning and we girls got the dinner. I wrote some in the afternoon and played a little on the piano The whole Whetstone establishment were out riding in the afternoon and stopped here. Rob and I went to church in the evening. Monday November 19th 1883 It was a very pleasant day. We had the washing all done by ten oclock and I went to town before dinner. I baked cake all the afternoon and Mary cleaned up the parlors. We cleaned all the lamps. I had a letter from Will that the contents surprised me, in regard to a business matter concerning himself.